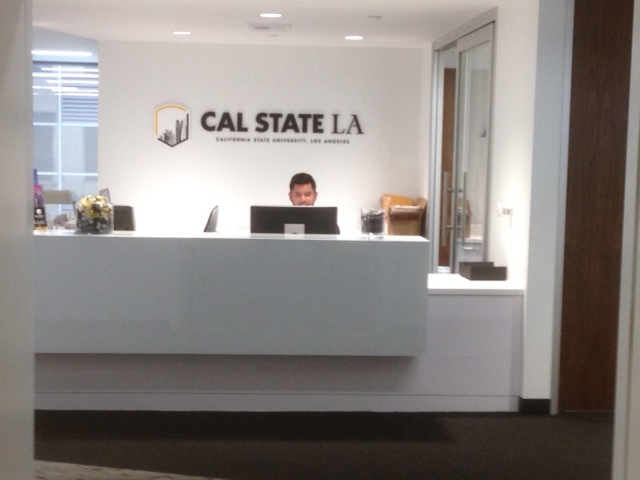 The front desk at Cal State L.A.'s new downtown campus in a high rise office tower. Though often outshone by their coastal neighbors, California’s central and eastern regions are home to millions of potential college students who could make the difference between the state boasting a thriving economy — or not. A new report identifies a handful of successes and some hurdles these regions must overcome to bring more of their students to and through college. The report details how high school students in the San Joaquin Valley and Inland Empire — plus Los Angeles County — are in need of funding and access to classroom seats to graduate from college with bachelor’s degrees. The stakes are high, as the three regions account for nearly half of the state’s population and are estimated to be home to half of the roughly 1.1 million additional college-educated workers California needs by 2030 to remain competitive economically. “We’re the only state that imports college graduates in large numbers and exports people who have less education in large numbers,” Johnson said. On the plus side, the areas studied are both graduating more of their high-school students on time and equipping those students with skills experts say are a pre-requisite for college readiness. Since 2005, the percentage of high-school graduates in the Inland Empire and San Joaquin Valley who’ve completed A-G courses — classes that the University of California and California State University systems require high school students to take to be considered for admissions — has climbed nine and eight percentage points, respectively, to 37 and 34 percent. For Los Angeles County, that figure climbed from 40 to 47 percent. The Inland Empire and the San Joaquin Valley together produce about 12 percent of the state’s students earning bachelor’s degrees, even though these two regions graduate 27 percent of California’s high schoolers. 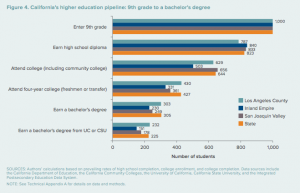 Los Angeles County has a narrower gap between the number of students earning college degrees and graduating from high school — accounting for a quarter of the state’s diplomas and 24 percent of the bachelor’s degrees awarded. The report points out two trends that help to explain why the Inland Empire and the San Joaquin Valley graduate a smaller share of bachelor’s earners. Their high-school graduates lag the state’s average on passing A-G courses, meaning the state’s colleges are less likely to admit these students. But just as challenging to overcome, and for entirely different reasons, is the relative dearth of college seats available in these regions. Based on the report’s projections on population growth, the two regions have fewer public universities and available seats than there are students in the region. While Los Angeles County is home to several Cal States and University of California, Los Angeles, the other regions have fewer public schools offering bachelor’s degrees. Other explanations for the shortfall in college graduates in the Inland Empire and San Joaquin Valley include lower than average college-enrollment rates and transfers from community colleges, the report notes. And while some students choose colleges that are far from home, most students, particularly those from low-income families or the first in their families to attend college, seek institutions that are close to where they grew up. The present economic conditions in the three regions also illustrate a catch-22, as Los Angeles County benefits from a diverse labor market replete with low- and high-skilled jobs. “In contrast, both the Inland Empire and the San Joaquin Valley economies have a high proportion of low-skilled jobs and low wages,” the report notes. Along those lines, “both regions export more college-bound students than they import from other parts of the state. This out-migration partly reflects the number and perhaps the desirability of regional public universities,” the report notes. For all these reasons, young adults in the Inland Empire and the San Joaquin Valley are projected to earn bachelor’s at UCs and CSUs at considerably lower rates compared to Los Angeles County and the state. 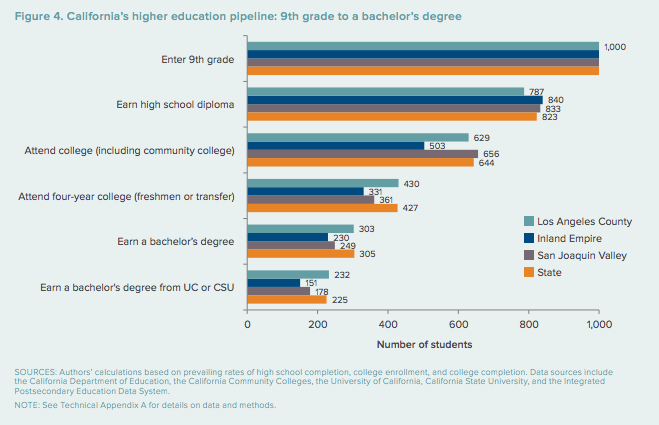 The report used current population trends and high-school completion rates to project that for every 1,000 9th-graders, 225 Californians will eventually earn a bachelor’s at a UC or CSU campus. In Los Angeles, the figure is 232 for every 1,000 students just starting high school. But in the Inland Empire and the San Joaquin Valley, the rates are 151 and 178 for every 1,000 9th-graders, respectively. The report identified numerous areas for improvement, including raising state money for not just new buildings but ongoing funds to hire and retain university staff. While the state’s spending on higher education has increased since the great recession, the CSU system is still receiving less money per student than it did before the economic downturn. Money for added construction is also scarce, the report indicates, as a 2006 bond for capital projects has been depleted. Senate Bill 483 would have issued a new round of bonds for higher-education construction, but the fate of that bill is up in the air. The report also commended the CSU system’s major effort to raise its four-year graduation rate to 40 percent and six-year rate to 70 percent — all by 2025. Moving more students out of remedial courses — classes that cost students money but don’t count toward their degree requirements — is a key element of that plan. Another “promising approach” the report points to is a 2010 program designed to improve transfer rates from community colleges to CSUs, called Associate Degrees for Transfer. Students at participating community colleges complete an associate’s degree and required courses and are then placed as juniors at CSUs — a way both to expedite graduation and save money because community colleges cost less. While the program has been slow to take off, nearly 2,000 such degrees were created by 2016, with enrollment in the transfer program growing from 700 students in 2011-12 to 20,600 in 2015-16. 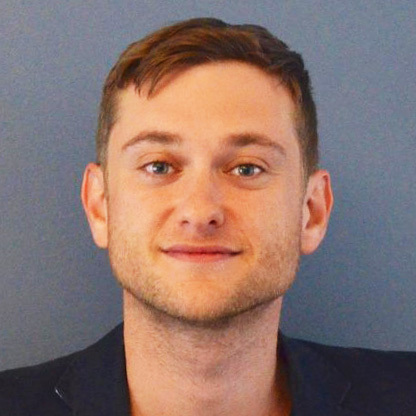 The article lacks one important thing: College educated people with “gender studies,” and “cinema deconstruction” majors will not fill the future tech jobs. Promoting the concept that more people need to attend college without having them trained for future jobs will simply saddle them with student debt, which they will have to pay back while standing in the unemployment line. Good article, but forgot to mention that community colleges are also now offering 4-year degrees under a pilot program initiated by SB 850 — legislation authored by Sen. Marty Block in 2014. Sen. Jerry Hill is authoring SB 769 which would double the size of the pilot. The community colleges’ 4-year programs would cost students much less.